Emma Kirkby is here ideally sparkling and light in the role of Achsah, daughter of the patriarchal leader, Caleb (taken here by the the bass, Michael George). Her love for Othniel, superbly sung by James Bowman, provides the romantic interest in what is otherwise a grand military oratorio... The singing is consistently strong and stylish, with the clear, precise tenor John Mark Ainsley in the title-role. 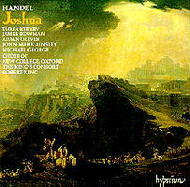 Robert King and his Consort crown their achievement in other Hyperion issues, and the choir of New College, Oxford, sings with ideal freshness.